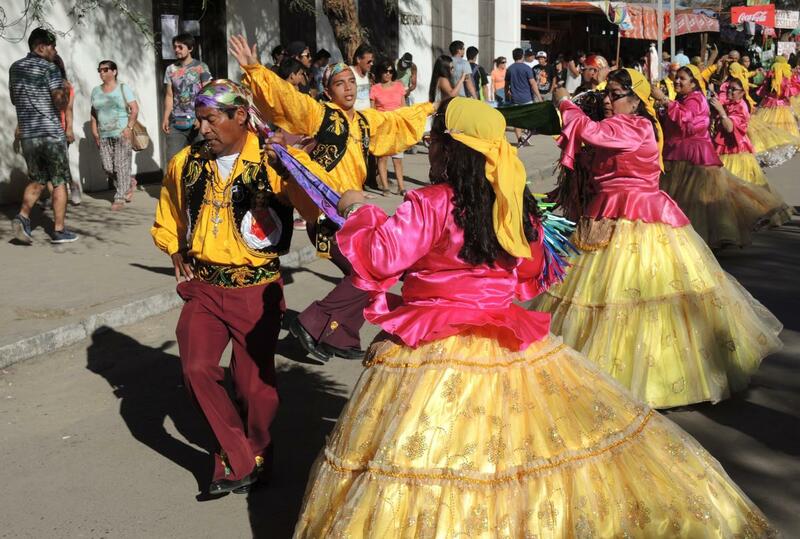 In La Tirana, northern Chile, in one of the driest deserts in the world, 200,000 people come together each July for 10 days of dancing at a sanctuary and feast dedicated to the Virgen del Carmen. The nearly 200 groups that dance there plan all year for the event, live together during the feast, and dance before the Virgin in a marvelous — and to outsiders sometimes puzzling — array of costumes. The town overflows with energy and activity from early morning until well past midnight each day. Dances before the Virgin take place 24 hours a day, and on the central days of the feast, other activities continue all night long, too. Devotees believe that dance, as a form of embodied prayer, is the fullest way of bringing their whole selves before the Virgin. The dances are also an important means of raising their children in the faith. Dancers refer to membership in the dance groups as a whole way of life. The number of dancers and attendees has grown considerably over the last century, involves large numbers of young people, and shows no sign of diminishing. While the geographic heart of La Tirana is the "temple" or sanctuary of the Virgen del Carmen and the plaza where they dance, bailes spend most of their time outside the plaza in living compounds. The dance celebrations at La Tirana are organized around the feast day of the Virgen del Carmen, July 16. But the full schedule, from July 10-19, has a number of other high points that make it so meaningful to those who make the pilgrimage there. The tradition of religious dance at La Tirana has both indigenous and Spanish roots. After the War of the Pacific, in the late 19th century, the feast at La Tirana became a feast for the Virgen del Carmen, the patroness of Chile.